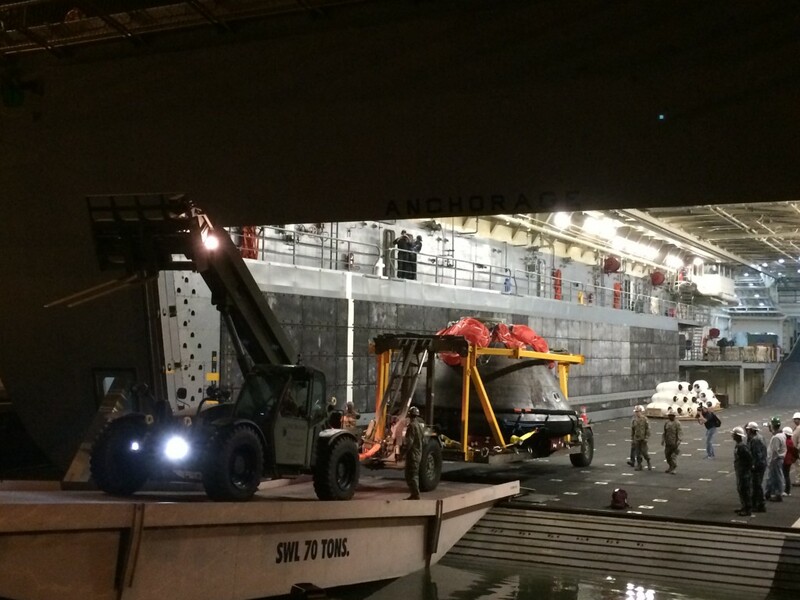 December 9, 2014 – NASA’s Orion spacecraft arrived in San Diego aboard the USS Anchorage Monday night. It will now be readied for its road trip back to NASA’s Kennedy Space Center in Florida. The Orion team anticipates the spacecraft’s arrival in Florida before the end of the month. The ship’s crew, along with NASA and Lockheed Martin teams, retrieved the spacecraft from the Pacific Ocean at the end of the highly successful Orion Exploration Flight Test on Friday. Engineers are getting their first look at the spacecraft. With the spacecraft recovered from the Pacific and brought to port in San Diego, technical teams are examining flight data recorders and samples of the heat shield to learn as much as possible about the performance of key systems during the test. Engineers have removed samples of the heat shield to examine its performance and ablation rates during re-entry. The samples, along with select data recorders, will be brought to nearby Lockheed Martin facilities for processing. This analysis will help the technical team get a head start in determining how to optimize the development of future heat shields. After launching from Cape Canaveral, Florida on December 5, Orion flew approximately 3,600 miles above Earth and orbited Earth twice, reaching speeds of 20,000 miles per hour and traveling through intense radiation in the Van Allen belt. Orion then endured a fiery re-entry into Earth’s atmosphere before specially designed parachutes slowed its descent into the Pacific Ocean. The test was designed to evaluate critical systems and mechanisms, including jettison events and the ability of the heat shield to withstand temperatures of 4000 degrees Fahrenheit. Throughout the flight, more than 1200 sensors recorded data from the spacecraft, which will be used to evaluate its performance and improve its design for future crewed missions. Orion will be loaded on a special truck for an estimated two-week trip across the country to Kennedy Space Center in Florida, where NASA and Lockheed Martin engineers will disassemble it and thoroughly examine its structure, computers and instrumentation. In March, as part of the Exploration Flight Test-1 (EFT-1) contract, Lockheed Martin will provide a complete data analysis report to NASA which includes information about the vehicle’s performance and recommendations based on the results. The EFT-1 crew module will next be used for Ascent Abort Test 2, which is a test of the launch abort system. Orion’s launch abort system is equipped with three powerful motors capable of pulling the capsule and crew a mile up and a mile away from an emergency on the launch pad. In addition, the Orion team has already begun procuring parts and manufacturing primary structures for the next spacecraft, which will be flown on the upcoming Exploration Mission-1 atop the powerful Space Launch System. Colorado-based Lockheed Martin Space Systems leads the Orion industry team as the prime contractor building the Orion spacecraft. Another Colorado company, United Launch Alliance (ULA), launched the Orion spacecraft on a Delta IV Heavy rocket, the world’s largest and most powerful launch vehicle flying today. Ball Aerospace & Technologies Corp. provided the phased array antennas and flight test cameras. In the future, Orion will carry astronauts on deep-space missions beyond the moon, to asteroids, and eventually Mars.